By the way I have subscribed to the bulletins of that company. But the truth and truth is that I have not been able to see what kind of material these figures are made of. I get the impression they are resin. Apart from that the prices are astronomical. Above all, I like the anti-chlamyte coelodonta (woolly rhinoceros) but they should specify the material with which their figures are made. They do not look bad precisely but on the contrary they are very well-shaped figures. thats a very cool looking wooly rhino. his models are made of resin, right? The Woolly Rhino is a resin figure. It's 1:20 ( 22 cm x 11 cm ). I think that the price is ok for a 22 cm resin figure, hand-painted and not mass-produced. From my point of view, that figure is gorgeous. I have the woolly rhino, cave lion, cave bear, and aurochs. I also have his wisent. 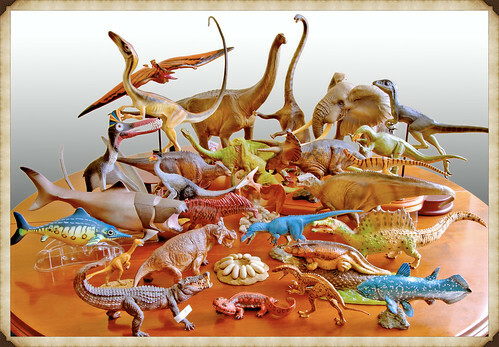 In fact, I order so often that he usually sets aside a new prehistoric for me whenever one comes out. They are pricey, but I highly recommend his work. I am very satisfied with everything I got from him so far. They are made of resin and hand painted. The woolly rhino is listed as 1/20, but it is on the big side of 1/20. You can get a good idea of how big it is compared to Sean Cooper's woolly rhino and calf. are you going to have the two S. Cooper figures painted? it would make a nice female for the much bigger Likaon model. These all look very nice, but if I had to choose 1, it would be the Tasmanian Tiger. Yes, I will eventually. And, yes, since the Likaon rhino is a male (as stated by the artist), I made the Cooper rhino a female. I initially did not want to order the Likaon rhino since I already had the Cooper one, but this turned out to be a nice solution to having two woolly rhinos. they are beautiful! I love the rare extant ones too like the addax. If I could only get one though it would be the cave lion. I just ordered Rhino and Lion. More pictures on my collection thread soon. 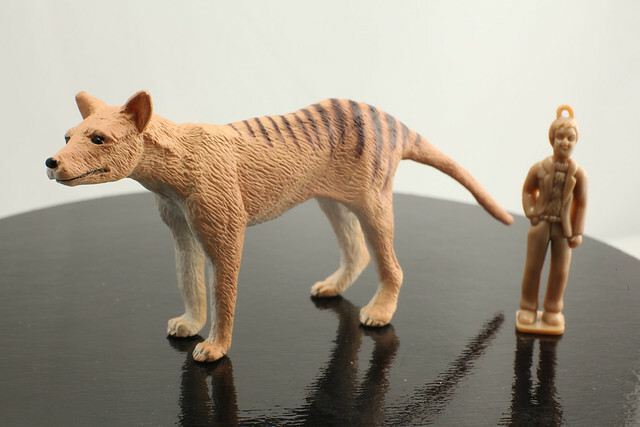 I'm not sure but I think it's the same artist who did the PVC version of the Tasmanian Tiger for Mojo Fun. Shall I put the woolly rhino in contention for the top 10 for 2017 poll? Does anyone own it? ..probably I'm one of the few with Likaon figures in his own collection..